Ok, ok, I have titled this post about two things but it worked so well together…lol. This is going to be a long one so take a moment and get a cup of tea or coffee and come settle in for some scrappy goodness, Eye Candy and giveaways. First off I wan to share with you my new Scrappiest layout I did for Liz over at The Scrappiest Blog. Her sketch inspired me to create an interactive page. It has been a while since I have done one and I do love engineering them … lol. If I can have the title of “Paper Engineer” I would put it on my ATCs. I love origami and if you all have not seen my Allspark Cube invitations for my son’s last birthday party… oh my, you have not! They are 3D allspark cubes and so cool. Well I try to post them up this week. I am digressing now, sorry. Back to the subject. Here is Liz’s sketch of the week and my take on it. WANTED – Two cute kids watching the Fiesta day’s Parade. These are my beautiful babies… just give me a moment to be a proud mommy… hehe. Every year we go to the Fiesta Days events here in our Loverly town of Vacaville CA. This is such a major event and we love to attend it… we kinda don’t have any choice though. The parade grand stands are about two blocks from our house and people always block us in the driveway. No Worries, though we just walk on over with our drinks, snacks, sunscreen and chairs early to save our spots. This year my Debonair husband was away on deployment protecting our country. Our wonderful landlords took the kids and I under their wings and let us chill with them during the festivities. The adults had Mimosas in the morning and Margaritas in the afternoon over at their house. This day was full of fun colors and Bright Skys. After the parade we head over to the town park where we ride on the Carnaval Rides and enjoy the music and other booths. I could go on for a while about how much fun we have there every year, I will stop for your sake and this long post…lol. On to the Details!!!! No detail shots today I want to talk about more of the look of this piece rather then the lack of detail… oh wait… you said you came here for details. Well I got plenty of very detailed work I did at the crop this weekend so stay tuned this week for more of those projects. This one is about texture and interaction. Background: This started with a brown cardstock with a scratched up pattern to it under all the western goodness. I then took a taupe colored cardstock distressed the edges and crumpled it up a few times until it would not lay flat…hehe. I inked this up with my brown ink pad so that the high wrinkles picked up the ink. I then distressed along the top and bottom with my crop-a-dial in both sizes and another standard hole punch. I love the way that turned out.. looks like someone shot a shotgun through it. The red bandanna paper was cut to shape and inked around the edges and adhered with foam adhesive to pop it up away from the BG papers to let the photo pull out set behind it. The “Wanted” title and poster was from a western patterned paper I had in my stash. I cut it out and inked the edges. I used Ranger’s walnut distress stickles on the letters and cut around the horse’s head to insert the bottom left corner of the picture. Embellishments: The Sheriff’s badge was from that western patterned paper as well I just cut it out and also used the distressed stickles on it. The flowers are prima, however I inked them with a water soluble brown ink and then placed them into a water mixture of brown ink and water. This aged and discolored them so they would coordinate better with this theme. I folded one in half behind the horse’s head and cut the red bandanna flower out of one of my scraps. The other flowers are clustered and layered together in the corner with a cactus and a spur from, yup you guessed it the western patterned paper. I created out of a thin twine one of the flowers in this cluster. The snaps I have had in my stash for quite some time they are old K & Company. I added a ribbon along the top of them so to help coordinate the ribbons used in the photo pullout. Journaling: I typed this up on the computer. Printed it on a cream colored cardstock. Inked it directly with my versa mark ink pad and chalked it with two different browns and a rust. I Cut them out and inked the edges. I love the way this style of journaling looks. Photos: The front photo has a cool effect I thought of late last night. I had these already printed and did not want to photo edit them. However I hated looking at the knees and legs of the people sitting behind my beautiful babies. I cut a piece of vellum the size of my photo and placed it over the top. I traced the outline of my kids lightly with a pencil and then removed the vellum from the picture. Placing it on my self healing cutting mat I used my exacto knife to cut along the line I traced. Placing this back on the photo it created a photo editing look and now my kids and my daughter’s monkey are back in front at the center of attention. She is such a Animal Fanatic. I also stamped the design at the top and then cut the mat around the photo. Once the design was dry I took the Ranger walnut stickles and went over the brown cardstock. Leaving the cream ink to show through. 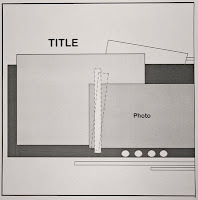 The Photo Pull Out: I saw this angled paper in the back of the sketch and new immediately this was going to be an interactive page. I took the other three photos I loved from the day and matted them with coordinating paper, inked the edges and punched a few corners.I used my crop-a-dial to punch and set the eyelets into the four holes in the top photo for my ribbon pulls and two holes in the bottom and top of the other photos also. Once the eyelets were set I just started adding ribbon. I used my tan stain ribbon to connect the photos together. I added a sentence of journaling on the top photo and folded it up and placed it back into the page. I hope these how to dos help and inspire some creative thought for you. I love sharing these with you all and I cant wait to share the projects from my first cyber crop with you. I will add them once a day this week. 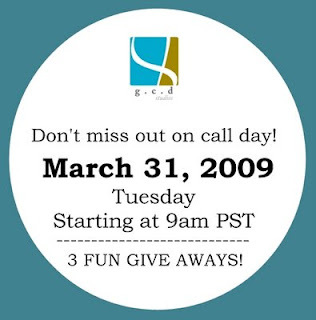 The GCD STUDIOS CALL part of my title… hehe – Ok, on to the last thing I wanted to chat about with you … GCD Studios has opened their doors to us all and has decided to hold a Design Team Call. The call ended on Saturday and they are having events on their blog all week as they go though the selection process. I have to admit I was extremely excited when I saw the call the night Heidi posted it up. I put together my best work and a fun cute application and sent it in within the first few hours it was opened. I try not to set my hopes high since there are so many wonderful scrappers out there, (471) to be exact as Heidi posted this morning, that would love this opportunity just as much as I did. WOW, yes 471 it the amount of applicants that sent in for the call and since Heidi loves to shake things up and have fun, just like the papers and products they produce, she is having a give away today and tomorrow being the **dum da da dum** call day even more goodies will be handed out at the event as they call all the new design team members to congratulate them! As you have noticed throughout this post I have random words linked. Well if you go click on them it will take you to the fun and fabulous lines of the GCD Studios. So go check out their blog today and tomorrow and see how GCD is bringing the fun back into scrapbooking! I am here but I am working on an online crop! Oh Grace, the LO is breath taking and thank you for sharing all the details in the making of this piece of Art work!!!! I just adore your work and will pray for you that you make the DT! You have such a style that they would be benefit from having you on their team!!!! GO GRACE!!!!! Have a Terrific Tuesday!!!! I think I’m at the end of the correct post where I want to tell you how fantastic this layout is, especially what you did with the background paper.